Many students across Catalonia answered the call of a students union and suspended classes on Friday morning (22 September). 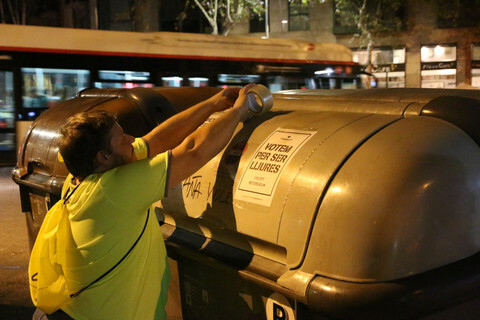 Under the motto: "We empty the classrooms for democracy," they filled up squares and streets, in favour of the independence referendum, which the Catalan government wants to organise on 1 October, and to protest against this week's police action to prevent it. "People are fed up and very active, so there is a clear push for mobilisation," Oriol Bartomeus, a professor of political science told EUobserver. The students' protest was part of a wider movement that started on Wednesday morning when 14 people - many of them government officials - were detained while Spanish police carried out raids in government offices. The last six detainees were released, with charges, early on Friday afternoon. "They have detained government officials for having promoted the referendum. We are here to defend the people who represent us," Arnau Capo, a 19-year-old student, told EUobserver on Wednesday, while demonstrating in front of the Catalan economy department. Inside the building, the police were searching for evidence of public money being spent to fund the referendum. "We found out through the social media where there were communications calling on people to go and give support to the people detained," said his friend Ignasi Espinosa, a 20-year-old student. "The idea is that it all has to be pacific and democratic - zero violence," he added. 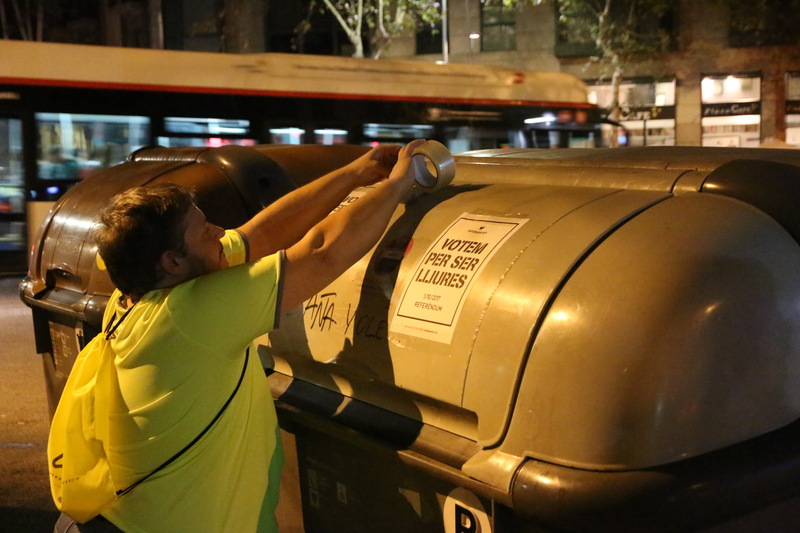 On Thursday, the protests continued on two other locations across Barcelona – one by the Arc de Triomf and by the Catalan Constitutional Court. 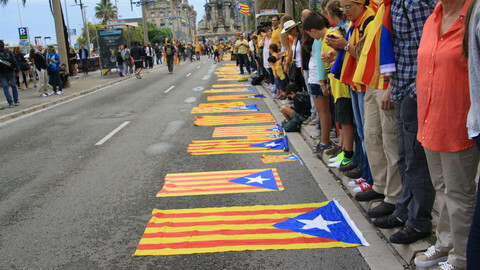 Across Catalonia other activist took to the streets in smaller groups. "My son asked me on my way out: 'Dad, where are you going with the big ladder', and I answered 'I'm just popping out to fix something big'," a man in his forties explained to a group of acquaintances by the market. Almost a hundred people had gathered in the dark. One carried a bucket and a brush, others had brought glue, while most carried big rolls of transparent tape. Black and white A4 posters were handed out to the people present, and some had brought their own. Soon the people started to form into smaller groups, going down the streets in different directions. Their mission: to put up campaign posters to stand in for the millions of posters confiscated by the Spanish gendarmes in the last few weeks. 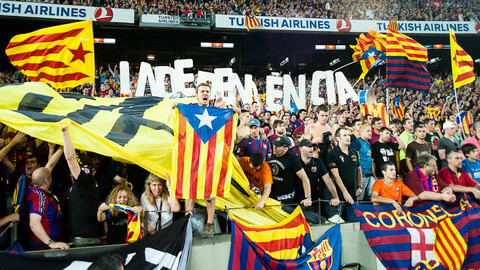 The poster movement has gathered momentum in the last few days, with a website coordinating meet-ups across Catalonia. "We were at home listening to the radio and we just decided to come here and join the protest," said 69-year-old Joan Ivern. "We are here to defend our rights, the ones of the Catalans - and because the Spanish government doesn't allow us to exercise our rights here in Catalonia, all we want is a referendum - whether it is for a yes or for a no," he said. "There is a call to demonstrate and to concentrate in certain areas," said Bartomeus, the academic. "I don't think you can call it a movement guided from above, but it's not a sudden impulsive action either." He said it was due to a combination of factors, including the organisation of civil society groups Omnium Cultural and Audiencia Nacional de Catalunya (ANC), which have been the organisers of the massive annual 11 September demonstrations for the past five years. On Friday, the Spanish public prosecutor accused the leaders of ANC and Omnium for treason, for having organised the demonstrations on Wednesday and Thursday. 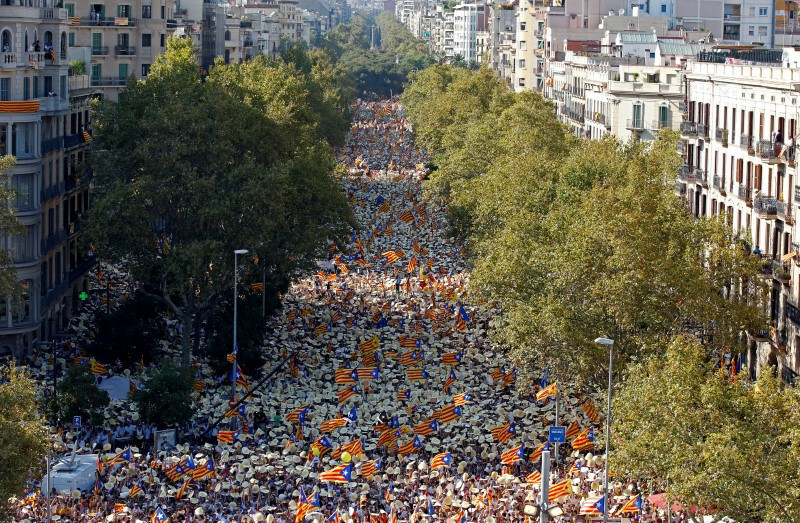 ANC leader Jordi Sanchez sent out an emailed message on Wednesday to supporters in Barcelona: "The concentration by Gran Via at Rambla de Catalunya continues to grow. It will take many hours. It will be peaceful. We are well organised. Today we will win." "They know that if they use violence, they will lose support," Bartomeus noted. "A violent action by the authorities would mean more support for the independence movement, while the same would be true the other way around." He said the separatist movement is already receiving some support from political parties and individuals because the arrests on Wednesday were a step too far for some. "There is now support from non-separatists, who are against the Popular Party (PP) and their methods, and many of them see an agreed referendum as a solution to the crisis in Catalonia," Bartomeus said, referring to the party of Spanish prime minister Mariano Rajoy. Around 75 percent of citizens in Catalonia are in favour of a referendum on independence. The Spanish interior ministry informed the Catalan regional government on Friday that it would send more security forces to the region to support the local police. "The functions will be to supervise public space and maintain order and they will act if the illegal referendum is held," the ministry said. Both in Madrid and in Barcelona, the governments are defending their actions in the name of democracy. "The two sides mask their final objective with beautiful words," political scientist Bartomeus said. "But the reality is that, on one side, there is a separatist bloc that wants independence and needs to accumulate strength because it cannot achieve it on its own. 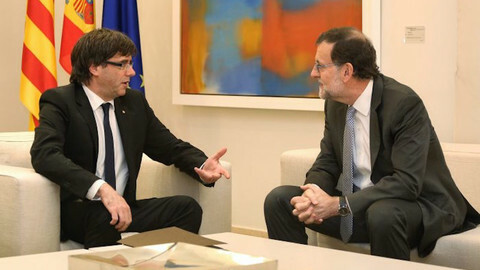 And, on the other side, the Spanish government and the PP are in a situation of extraordinary weakness." He said that the PP is facing an investigation over corruption cases "so big that in any other country in Europe, it would have made the president resign and would probably have destroyed the party." As a consequence, he argued, the PP is using the conflict with Catalonia to stay in power. Back on the streets, where independence activists are hanging up posters, the sound of tape being unrolled is heard in all directions. 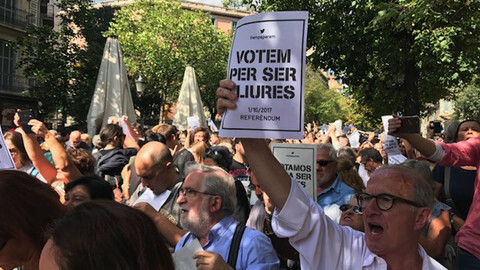 A 50-year-old singer, Jordi Vallespir, is hanging up posters in different languages with the message "we vote to be free." He has a feeling that this time it will happen. "We would love for Europe to help us, but we are very sceptical about whether Europe will come to our help. The past has shown too many times that they turn their face," he said, while referring to the Balkan war in the nineties and the current refugee crisis. "But it's okay - we can do this," he adds. 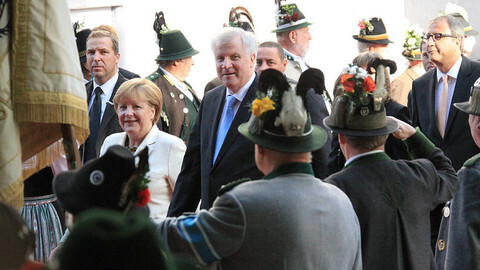 "There is this romantic idea that Europe will help us - but no. 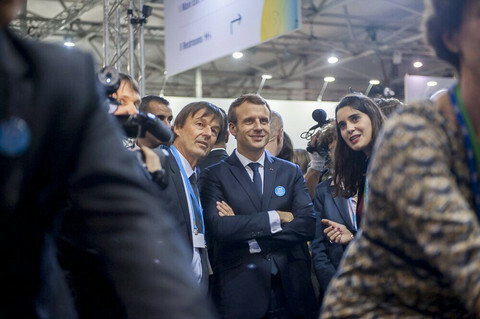 Europe will do what is economically in their interest," said a fellow activist across the road, 50-year-old Marta Serra. "We'll probably end up here on our own, but we're used to that anyway."